It is my honor to introduce something truly new and perhaps highly significant to the EE/GE community and an alternative to consider for the broader world of Physics. In an article below Michael Netzer presents a new alternative geometric structure of a Hydrogen atoms nucleus, and thus the basis of all nuclei. Without some introduction, the value of this may easily be missed. The issue is that Earth Expansion (EE), and Growing Earth (GE) theory go against most scientists deeply held belief systems and although there is widespread earth surface evidence many state they won’t/can’t believe until a suitable “cause” is developed. Plate Tectonics has never been required to do this, but the EE/GE community keeps researching. Neal Adams developed a theory around a known Positron and a known Electron combining together to form a Prime Matter particle. www.nealadams.com/index.php/science. The breakthrough brilliance of this idea was that all matter that we can sense is a form of electromagnetic force. But to make the Big Bang theory work we are missing 90-95% of the known matter. Where is it? In Prime Matter he theorizes that the matter is all around us but is cloaked into apparent invisibility. That the Positron and Electron are united by an electromagnetic force, but that this force is inward facing and thus not (yet) detectible with our current instruments. Hydrogen is the visible foundation block of the Universe comprising perhaps 75% of the known matter. Understanding Hydrogen helps understand all other atomic interactions. The “mass increase” argument – is the most likely to explain the known anomalies within the GE/EE knowledge base. However, it is tossed aside and ridiculed, because it can’t be explained or visualized by many. It should be recognized that the earlier (widely believed) cosmology theory of the Aether required small mundane undetectable particles to be streaming into the earth’s core. The newer cosmology of Big Bang is premised on the widely held belief that there is 90-95% missing and undetectable Dark Energy and Dark Matter out there that we must find.http://www.eearthk.com/article01/ Notice how Neal’s Prime Matter theory and Aether theory, and Big Bang theory are saying nearly the same thing about the missing matter. Neal’s and Michael’s explanation gives an alternative pathway to research. It is the core of the hydrogen atom that is most important. The hydrogen nucleus consists only of one Proton (no neutron) which contains virtually all of the atoms mass. The mass of the electron is negligible. The volume of this atom is defined, however, by the electrons orbit. The radius of a hydrogen atom (orbit of electron) is about 100,000 times bigger than its Proton’s radius. The volume of the atom is, thus, mostly empty but is about 1,000,000,000,000,000 times larger than the Proton’s volume. Ionic hydrogen loses its electron and can eventually regain it. Much can take place in these transformations. The Electron to Proton Mass relationship can be seen at: http://en.wikipedia.org/wiki/Electron An excerpt: “An electron is a subatomic particle that carries a negative electric charge. It has no known substructure and is believed to be a point particle. An electron has a mass that is approximately 1836 times less than that of the proton.” Consider that the number utilized in the following article is 918 which is ½ of 1836. The New Hydrogen Nucleus Structure is a geometric model which demonstrates a count calculation of the layered Prime Matter particles bound by the force of a core positron, to form a proton. As an electron is attracted to the new proton, a new Hydrogen atom is born. In his elegant theory for emergence of new atomic matter in the universe, Neal Adams states that new protons effectively emerge in the cores of celestial bodies through layered accumulation of 918 Prime Matter particles around a positron, in a process commencing with Pair Production. A Prime Matter particle is the combined electron and positron fields which are theorized to neutralize each other upon converging in the Positronium state, thus rendering themselves undetectable and are assumed to annihilate. Each Prime Matter particle carries an electron weight of two (2), one positron and one electron. The accumulated electron weight of the predicted 918 Prime Matter particles in the model is therefore 1836, same as the electron weight of a proton. A verifiable calculation of the number of particles in a geometrically sound model is considered crucial to the veracity of Positron-to-Proton Theory. In his Prime Matter video, Neal states that a cube of five (5) Prime Matter particle layers are held together by a core positron. 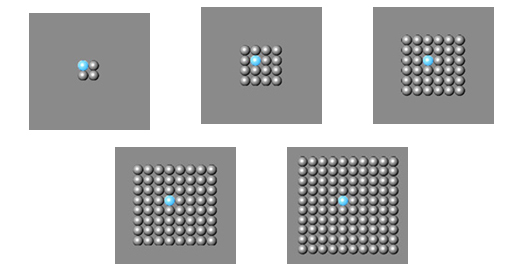 The number of particles in each respective cube layer is demonstrated visually as being a succession of 2, 4, 6, 8 and 10 particles to each side of the cube layers. It is also stated that because corner particles are further away from the core, they would tend to not adhere to the cube. That upon removing 10 particles from each corner (total of 80 particles for the 8 corners of the cube) the remaining result would be 918 particles (plus the core positron). 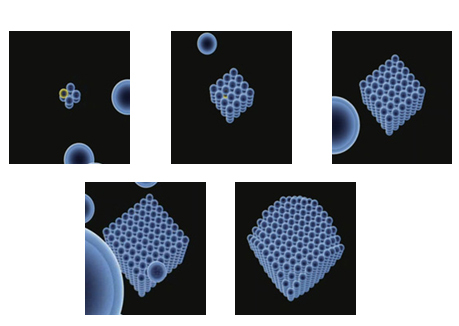 The images above, captured from the Prime Matter video, demonstrate the succession of layers added to form the cube (2, 4, 6, 8 and 10 particle to each side) and culminating in the more rounded geometrical result achieved when the corner particles are removed. It is then stated in the video that after removing the 80 corner particles, we are left with 919, after which we subtract the core positron particle and the predicted result of 918 particles is achieved. In a recent discussion of the model with Keith Wilson, writer/producer and proprietor of Expanding Earth Knowledge website, he told of his effort to independently calculate and verify the model. Keith’s calculations yielded a discrepancy of one (1) particle, relative to Neal’s model. My attempt to also verify Neal’s count yielded the same discrepancy. The calculation fails to yield the predicted result of 918 particles. Having previously assumed that Neal’s model is geometrically sound and verifiable, and perhaps also due to considering the thrust of Neal’s Prime Matter Positron-to-Proton Theory to be sound regardless of the model, I was compelled to pursue a resolution to the discrepancy. Keith’s disappointment in failing to yield the predicted result and his demonstrated regard for the thrust of Neal’s work, prompted me to examine the model with greater scrutiny. An underlying principle of the strong force binding a proton is that the cube model must be packed to the utmost degree of tightness possible – and that the positron must reside in the absolute center of a geometrically sound model. However, as evident in the video and captured images, and as demonstrated in these images above, the positron cannot reside in the center of a model which has an even number of particles to each of its sides. This geometric discrepancy gravely compromises the integrity of the model. 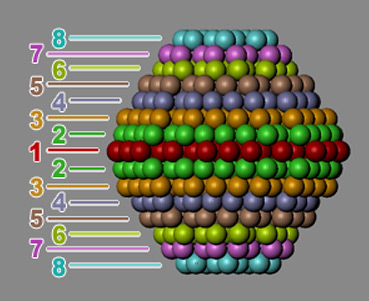 Only a geometry of odd numbered particles to each side of the cube, (3, 5, 7, 9 and 11 particles to each side, as in images above) can yield a geometrically sound model where the positron is at the absolute center core of the model – and the particles are packed together to the utmost tightness. However, a calculation of the particles in a model with the above parameters yields a result nowhere near the predicted 918 particles. More than a dozen further attempts, using varying possible parameters that might yield a number within the proximity of 918 particles for the cube model also failed. In a following communication with Keith, we discussed the geometric and mathematical discrepancies, and how Neal might have overlooked them in asserting a positive result. Most importantly, Keith stressed the advantage that a geometrically sound and verifiable model would add toward explaining Neal’s theory – and the need to present it with clear diagrams that would leave no doubt as to its veracity. Keith pointed out that the cube model allows no room for nesting of particles which would pack them more tightly together around the positron. I then began to consider another geometric basis for the model that would begin with a more spherical form – rather than arrive at it by removing the corners from a cube. Using Blender software, an Open Source 3-D modeling program, I began by creating a sphere, tightly contained within a ring of 6 equally sized spheres, which fit perfectly around it. A new geometric form for the model began to emerge. A hexagonal formation around the positron provides for a more tightly packed model and a more spherical initial form upon which to build it. 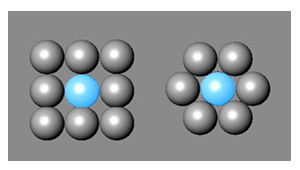 In this formation, six (6) particles pack tightly and adjacent to the core positron particle in the first layer row, while in the cube formation only four (4) particles touch the core positron. The negative space between the hexagon particles is also reduced to nearly 1/5th of the negative space in a square. 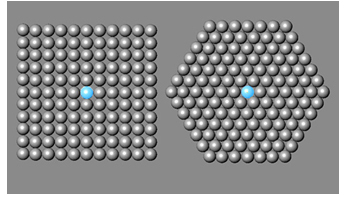 Onto the first layer row of the model are nested three particles above and below the formation. 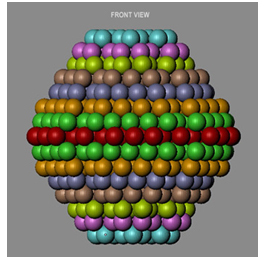 The model then grows by expanding each hexagon row and adding additional ones above and below, all nested tightly between the particles, maintaining a hexagon form. 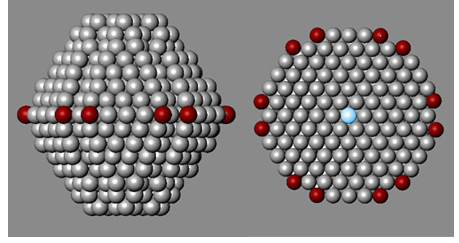 As each row is added and expanded, the tight packing of particles and hexagon model integrity are maintained. Until the model achieves seven (7) hexagon rows above and 7 rows below the largest center row which contains the positron particle. 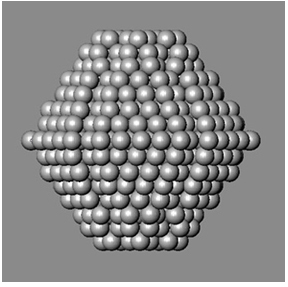 The six (6) corner particles of each hexagon in all the 15 rows of this model are removed, falling off as they do in the cube model, further rounding out the formation. However, the middle row is unique in that it is the single largest hexagon and both layers above and below it recede from it too sharply. Even after removing the 6 corner particles, the two (2) particles (total of 12 particles) adjacent to each corner particle that was removed, continue to notably protrude from the model. 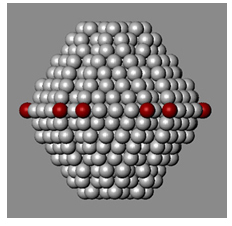 These additional 12 particles then also fall off from the model and are removed from the largest middle hexagon row only. Front view of the completed model, color coded by rows. 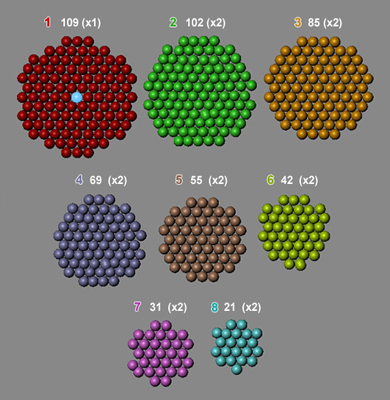 Identical rows nested above and below the largest middle hexagon row carry the same color and row numbers, to facilitate the particle count verification process (see below). Side, top and perspective views of the model. Though not a perfect visual accuracy (due to manual nesting of particles and rows in the 3-D software), the model is geometrically perfect and consistent. Some “waviness”, visible from certain angles, is partly due to asymmetrical hexagons in rows 2, 4, 6 and 8 – a geometric result of the nesting process (see image below). The overall integrity of the model is nonetheless maintained throughout all its layers – and the positron continues to reside at the absolute center core of the model. Above is the numbering key for the 15 rows of the model. 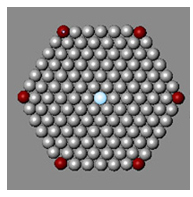 In the image below, the layer hexagon rows are separated from each other in a top view, and the number of particles indicated for each layer. 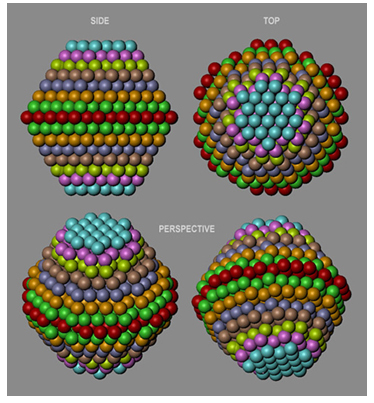 Verification of the model is completed by compiling the number of particles throughout all its layers. Subtotal: 919 – minus one core positron particle in row 1. 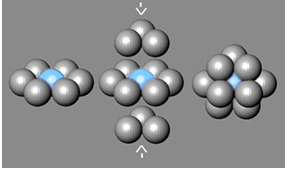 Having verified the results independently, Keith suggested the name “New Hydrogen Nucleus Structure” for the model in order to better reflect the wide-scope ramifications it holds. We then proceeded together to refine this presentation.